Jawaharlal Nehru Technical University (JNTU) conducted TS EAMCET 2018 online exams from 02-05-2018 to 07-05-2018. TS EAMCET 2018 Answer Key is releasing after a few days of the examination. TS EAMCET is the state level entrance test of Telangana state. Through this exam, students are admitted to the Engineering, Agriculture and other Programmes in various colleges of the state. This common entrance test is conducted by the JNT University Hyderabad. Here, we are providing complete details about TS EAMCET Answer Key 2018. The TS EAMCET 2018 Unofficial answer keys will be published by various coaching institutes but the official key will be released by the conducting body. The candidates will be able to download the answer key wise, which are (Set A, B, C and D) The official answer key will be released in two phases. The first answer key that is released is the Provisional Answer Key that will contain the solutions to the 160 questions asked in the exam. These answer keys are open for challenge provided that it is supported by authentic claims. The final key released afterward in around mid of May 2018 cannot be challenged though. Check more details on TS EAMCET 2018 Answer Key from the page below. Check here latest updates about TS EAMCET Answer Key 2018. 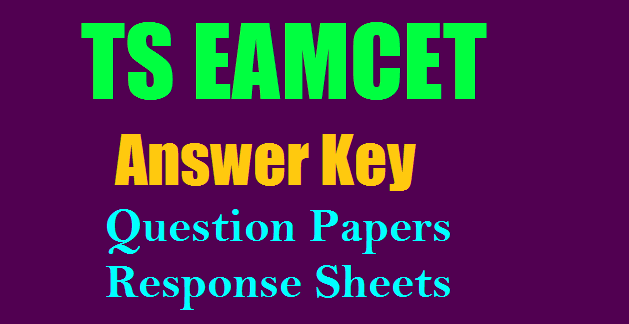 Get details of answer key releasing mode, date, marking scheme , how to download TS EAMCET 2018 answer key. It is released separate for engineering & agriculture courses. Candidates can check it through online mode only. Also, get question papers & OMR sheets The TS EAMCET Answer Key is designed in such a way that a student can analyze his / her exam performance on his own before the result is declared. The candidates will be able to track all the events related to the answer key from below. The score calculate through the answer key are not be considered as the final one. The actual mark will be announced through the result. Answer Key: The answer key of TS EAMCET 2018 will be released on the official website eamcet.tsche.ac.in. Step 1: Click on the link to navigate to the TS EAMCET answer key 2018 download page (link will be updated here as soon as JNTU officially releases it). Step 2: The answer key of TS EAMCET 2018 for all the question sets will be on display on this page. Step 3: Candidates have to download the answer key for the question set that they had appeared in the entrance test. Step 4: Once aspirants download TS EAMCET answer key, they can calculate their probable scores as per the marking scheme of the test and form an idea of their result.